Chasing My Heart Teasers April 2019 – Upcoming Star Life drama series ‘Chasing My Heart’ teasers, previews, updates, episodes, highlights and spoilers for April 2019. Naina is shocked to learn about Ahana's accident. After returning to India, Naina recalls the promise she made to Ahana! The Mehras request Raghav take them to India with him. Naina gets a job but faces hardships. Pandey asks Naina to pick up the client from the airport. However, unaware of Raghav's identity, Naina suspects him to be a terrorist! Pandey confronts Naina for getting their client arrested. Later, Naina is stunned to see Raghav at Pandey's office. The Mehras are forced to seek help from Raghav. Naina faints in front of Raghav after he fires her from her job. Veer promises Mr Khurana that he will ruin Raghav's life. Raghav asks Naina to work as his personal secretary. Will Naina agree? Raghav tells Pandey to secretly pay the school fees for Sharma's children. Later, Pandey asks Naina to visit Raghav's house and give medicines to Indu. Naina admits Indu to a hospital on seeing her in a critical condition. Later, Naina interrupts Raghav's live interview. Raghav and Naina take Zenobia to a hospital. Naina is shocked when Raghav misleads the police about the car that hit Zenobia. Raghav gets blackmailed into lying to the police about the stranger's misdeed. Later, Naina confronts Raghav for lying to the police. Raghav welcomes Armaan and his family. Later, Armaan threatens to defame Ira by publishing her MMS. What will Raghav do now? The police arrest Armaan, while Raghav terminates Naina from her job. Armaan blackmails Raghav to make Ira's MMS viral if he doesn't get him out of the jail. Parth stops Raghav from sacking Naina. Later, Raghav keeps troubling her. Will she be compelled to quit? Veer informs Armaan about his plan against Raghav. Meanwhile, Raghav asks Armaan for proof. Will he learn about Veer's conspiracy? Armaan threatens Raghav and puts forward a condition. Raghav is surprised to see Naina, Pandey and the other employees at his house. Naina is caught stealing the USB from Raghav's pocket. Later, Raghav rejoices when Armaan gets arrested. At his staff's insistence, Raghav agrees to attend the Holi party. Parth spikes the soft drink meant for Naina. Naina confronts Parth and asks him to stay away from her. Later, Raghav dances with Sonali to make Naina feel jealous. Parth takes advantage of Naina. He threatens to publicise that she is pregnant when she slaps him. But Naina's reaction takes him by surprise. Naina lashes out at Raghav. Dilraj rescues her from a man who tries to humiliate her. Later, Raghav exposes Parth. Raghav beats up Parth. Later, Raghav tells Khurana about Armaan's wrong-doings. Khurana's lawyer reveals a surprising truth to him. Naina is shocked to see her pregnancy reports on the presentation screen. Meanwhile, Khurana makes a shocking revelation to his mother. Raghav proves his innocence to Naina. Later, Naina tells Zenobia and Dilraj about her pregnancy. Naina taunts Harjeet as she tries to bribe Zenobia to save Armaan. Khurana threatens the doctor for the surrogate mother's details. Later, someone sends Naina's photograph to Harjeet. Raghav humiliates Khurana and asks the security guards to throw him out. Later, disguised as a beggar, Harjeet blesses Naina's baby. Khurana asks his associate, Shukla, to find the surrogate mother. At the same time, Harjeet decides to harm Naina and hires a man to keep an eye on her. Raghav learns that the apple he had eaten was poisoned. Harjeet misleads Khurana about the surrogate mother. Meanwhile, some men attack Naina and try to kill her. Raghav rescues Naina from the goons but she is shocked to hear that he had planned the attack. Later, Parmeshwari tells Harjeet something about Naina. Raghav arrives with the police and asks Naina to shift to his house. Later, Pandey tells Khurana that the woman in the photograph is Dr Sonali. Naina is stunned as Rehan Khurana tells her that she is carrying his baby. Meanwhile, the employees learn that Naina is Raghav's wife. Khurana tells Harjeet that Raghav is the father of Naina's baby. Later, as Naina and Raghav argue, Dadi wakes up from his coma. Balraj rejoices on learning that Indu does not remember her past. Later, a special puja is organised for the well-being of Naina's baby. Harjeet continues to plot against Naina's baby. Later, Indu questions Raghav about Naina's baby. Will he and Naina reveal the truth? Raghav and Naina are shocked when Indu gives consent for the DNA test. Later, Ira takes Zenobia to meet Armaan. Everyone is shocked when the DNA test results come out. Harjeet and Armaan introduce themselves to Indu. Later, Indu tells Raghav about her attacker. Raghav and Veer have a fight. Later, the police arrive to arrest Veer. Meanwhile, Naina has a nightmare. Veer manages to overpower the authorities and escape from the prison. Meanwhile, Harjeet continues in her ploy to kill Raghav. Will Raghav survive? Veer takes Naina captive and tortures her. Indu pleads with Veer to release Naina. Can Raghav and Khurana rescue her? Veer snubs his parents for betraying him. Later, he endangers his life while trying to shoot Raghav. What will happen now? Sudha apologises to Naina on Veer's behalf. Harjeet moves to Raghav's house with a plan to kill Naina. Sudha tells Harjeet about her plan against Naina. Harjeet and Sudha decide to kill Naina. Later, Harjeet is shocked when Rihaan informs her that he had rescued Naina. At the condolence meet for Veer, a stranger drops the piece of evidence near Naina to prove Raghav's innocence. Armaan plans to harm Naina, but Raghav comes to her rescue. Later, Naina sets out to find Renu Kapoor. Why? Harjeet leaves the house after a heated argument with Indu. Meanwhile, Naina is shocked to see a photograph in Renu's house. Whose photo is it? Naina stops Raghav when he tries to open up about his problems with her. Raghav gets tense when a shop owner recognises him. Meanwhile, Khurana decides to do Ahana's post-death rituals. Harjeet hatches an evil plan to kill Naina. Later, Raghav and Naina attend the function at Harjeet's place. Will Harjeet succeed this time? Raghav is shocked on seeing his elder sister, Seema in the Khurana House. Later, Harjeet informs Sudha about her plan to kill Naina. Seema surprises everyone with her strange behaviour and tries to stop Naina from performing the hawan rituals. Later, Naina asks Raghav about Seema. Will he tell her the truth? Naina is stunned to know that Raghav is Seema's younger brother. Later, Seema reveals a truth about Veer's murder to Naina. Raghav is shocked as Naina brings Seema home. Enraged, Harjeet plots to kill Naina with Sudha's help. Raghav visits Khurana. A few thugs trap Naina in the stadium and tie a bomb to her. Will anyone come to her rescue? Naina leaves a few clues for Raghav, so that he can find her. Harjeet asks her goons to kill Naina. The goons are shocked when Naina informs them that the bomb is activated. Naina gives birth to a baby boy after Raghav rushes her to the hospital. However, the baby needs a blood transfusion from his biological father. Raghav convinces Khurana to donate blood for the baby. Back at the hospital, Harjeet deceives Naina and declares to claim the responsibility of the baby. 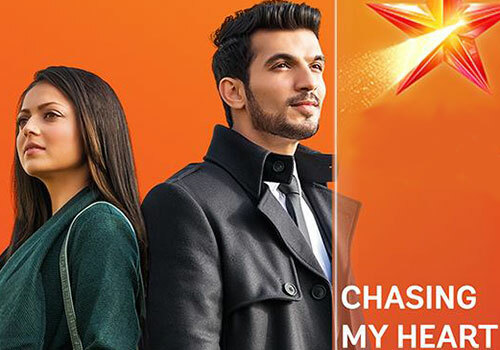 Premiere episodes of Chasing My Heart airs on Star Life from Mondays to Sundays at 18h00.